A comprehensive development like no other, Port Imperial along the Hudson River continues rising as new residents clamor to be part of a whole new thing. A community in itself, the $2 billion devel­opment stretches over two miles along the waterfront. It is rapidly transforming the area with soaring residences, shops, restaurants, parks, playgrounds, and a waterfront promenade. Access to a con­venient intermodal transportation sys­tem, anchored by the Port Imperial Ferry terminal — with service to midtown and downtown Manhattan —is a major draw. A pantheon of notable developers had a hand in this futuristic complex, projected for completion within five years. At the heart of it all, the Lennar Corporation is responsible for The Avenue Collection — five ultra-luxury condominium buildings comprising 669 total units. 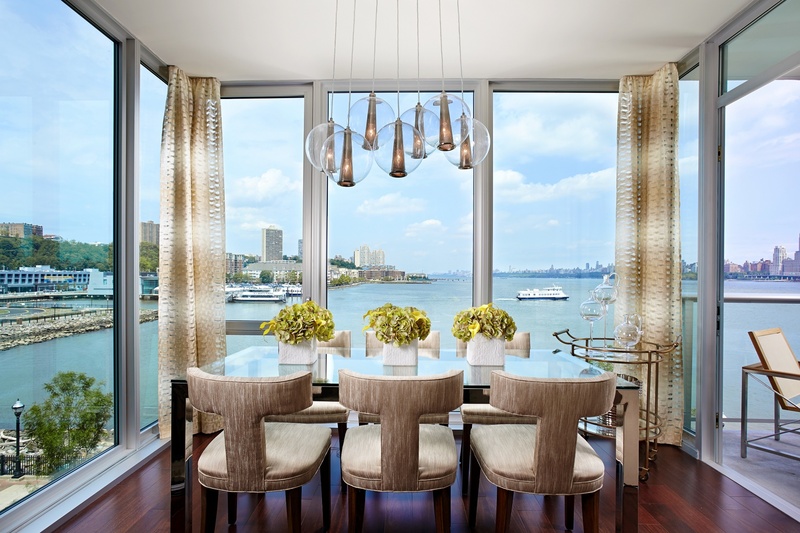 The residences are located on a prime waterfront site in Weehawken facing midtown Manhattan, where ten­ants enjoy skyline views from every room. Opened in July 2014, the first building, the seven-story, 74-unit bou­tique 1000 Avenue at Port Imperial, is nearing 75 percent occupancy. Four new designer model residences were unveiled recently, showcasing the high-rise’s upscale living spaces. A fifth model is expected soon. Units offer a variety of floor plans, including a three-bedroom, three-bath residence with a spacious out­door balcony and sweeping views of the Manhattan skyline, to two-bedroom homes offering northwest vistas, then a one-bedroom duplex with a den and private street entrance. The three-bed­room model was designed by renowned Connecticut interior design firm Linda Ruderman Interiors, while the one- and two-bedroom models were merchandized by Tui Pranich of Tui Lifestyle. Based in Manhattan and Miami, the designer is known for creating turnkey, thoughtfully-styled, fully-decorated room settings replete with luxury furniture solutions, decorative accessories, and lifestyle amenities.